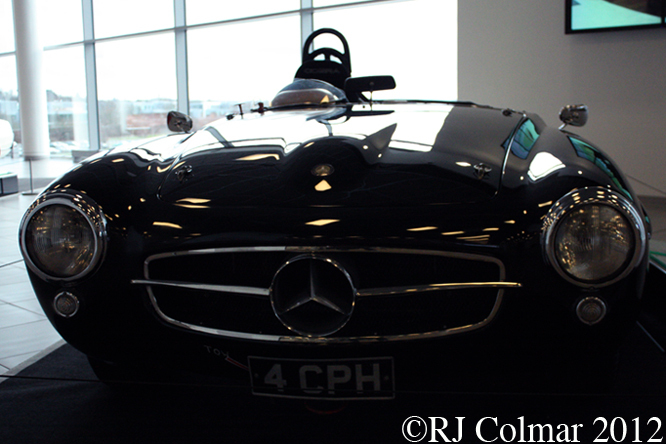 As one of many birthday treats a couple of weeks ago I re visited Brooklands and before I got there I found time to pop into Mercedes Benz World which came highly recommended by an old school buddy Dave whom I met there for a cuppa and a catch up in the Mercedes Benz World Café. I got there a little earlier than Dave and my curiosity got the better of me the moment I walked through the door. 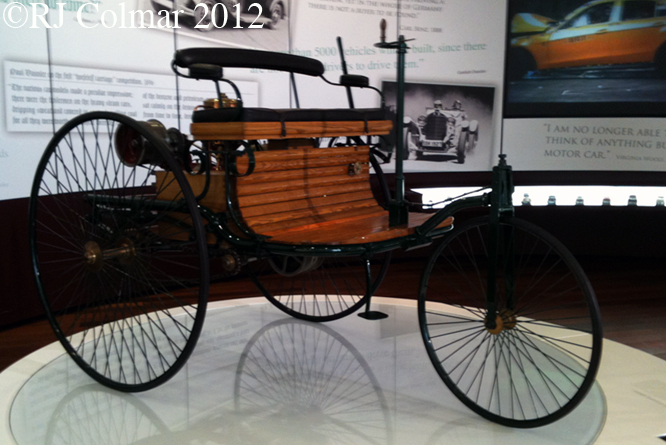 Above a Mercedes Benz Patent Motor Car of the type that Bertha Benz took for a 110 mile spin with her sons without her husband Karl, who invented the machine even knowing about it ! 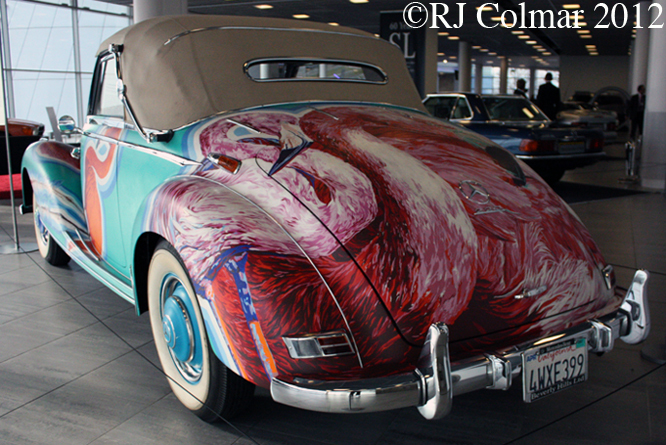 Among the more unusual exhibits was this Mercedes Benz 220a which is one of 17 that has been restored and transformed into an unuseable work of art by the painter Hiro Yamagata. Mercedes Benz officially withdrew from racing at the end of 1955 though it has since emerged that Mercedes Benz were involved in supporting the efforts of GALPOT contributor Geoffrey Horton’s uncle George Tilp and on my visit to Mercedes Benz World I was surprised to learn that Mercedes Benz also supported Hong Kong’s Mercedes Benz agent efforts to win the 1956 Macau GP. (British) Army Sergeant Doug Steane winning the race in the works prepared 121 mph 190 SLR of which just two are known to have been built in 1956. Back in December I related in a Ferrari Friday blog the story of the Sultan of Brunei and his six Ferrari 456 GT Venice cars purchased for a cool $7 million seems that around the same time the good Sultan purchased two Mercedes Benz CLK GTR’s one of the 20 Coupés in Silver the other one of six Roadster’s in blue both easily identified because they are the only two CLK GTR cars fitted with Right Hand Drive, making the car in the foyer unique of it’s type. 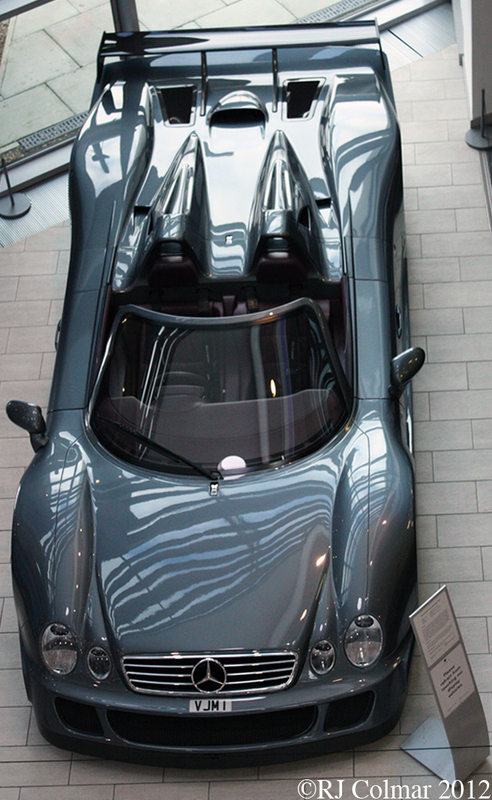 The Sultan will have paid a minimum of $3 million in 1999 for the two CLK GTR’s when he sold them at auction ten years later he only got just short of $1.8 back for the pair. 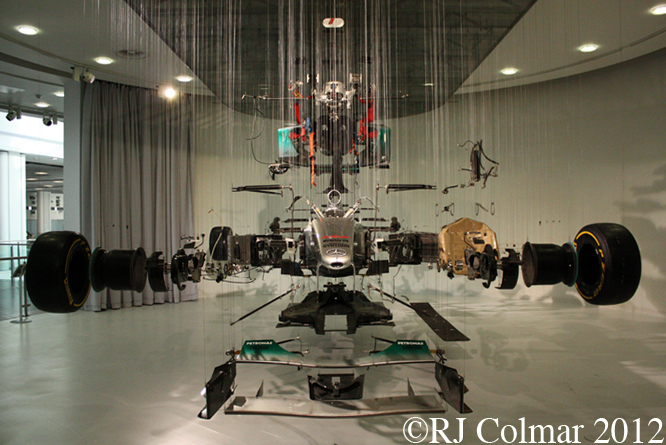 Mercedes Benz World has a surprising amount of art on display qualifying as the wildest in my humble opinion is View Suspended II by Dutch artist Paul Veroude which features 3200 components which nominally go to making a Mercedes AMG Petronas Formula One™ Team car suspended from the ceiling, although the parts do swing in the wind they are held reasonably securely in place by steel wires which took ten people a week to hang. It would be difficult to end this little over view of Mercedes Benz World with anything other than a range topper, unfortunately the Maybach’s in the service center were all privately owned so I hope you enjoy dribbling with me onto your keyboard while taking in the Mercedes Benz SLS AMG which went on in the United States last year for ‘less than $200,000’, so it should be well within the reach of your average jackpot winning lottery winner. Thanks for joining me on this ‘Oh Lord !’ edition of ‘Gettin’ a li’l psycho on tyres’, I hope you will join me again tomorrow. Don’t forget to come back now ! 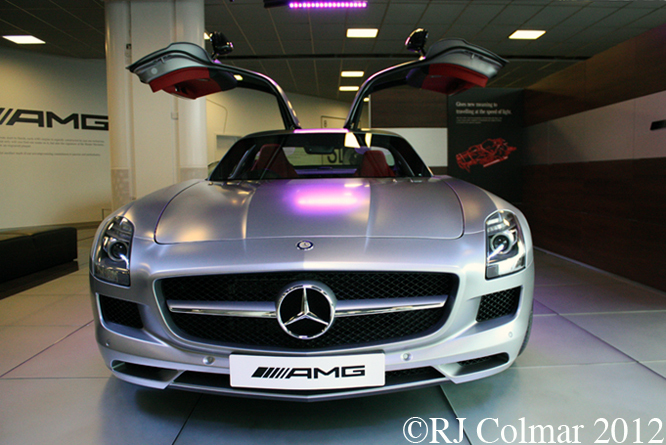 This entry was posted in Uncategorized and tagged 190, 220a, AMG, Benz, Car, CLK, Colmar, GALPOT, GTR, II, Mercedes, Motor, Patent, Ralph, SLR, SLS, Suspended, View, World on March 5, 2012 by Ralph.